Universal Nutrition Animal Stak is a complete all-around anabolic hormone booster. 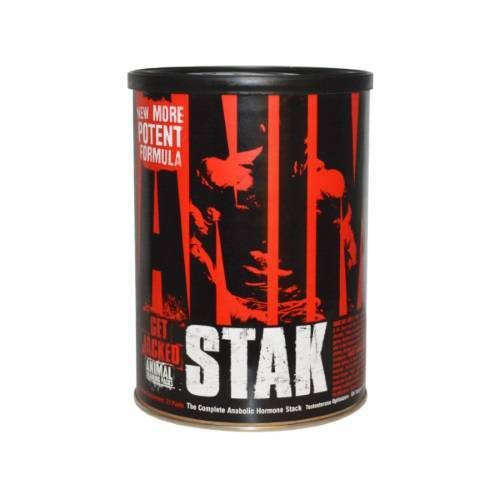 Universal Nutrition Animal Stak has long been built on being a complete anabolic hormone stack. Animal Stak also contains specialized hormone amplifiers and ingredients to optimize ones internal anabolic environment. Customers from UAE and KSA including Dubai, Abu Dhabi, Riyadh, Mecca, and Jeddah order testosterone and GH booster online. With Animal Stak you get a mega-potent dose of 1500mg of testosterone boosters. The Pro Testosterone Complex found in Animal Stak includes a variety of ingredients that help to elevate both of your testosterone levels: free and total. Testosterone is the primary hormone that interacts with skeletal muscle tissue and as many knows, testosterone's role is paramount in muscular development. When it comes to optimizing testosterone levels, there's a couple of things to take into consideration. You want to make sure your testosterone levels aren't low - nutritional deficiencies can cause low serum testosterone levels. You also want to make sure that your ratios of "free" testosterone to "total" testosterone are advantageous. Free testosterone is the form of testosterone that exerts the anabolic effects strength athletes are after; it's the stuff that gives you results. By addressing all these issues, you could tap into your body's true potential. * Stak gives you one and a half grams daily of natural test support in every pack. That's serious. What are the functional ingredients present in Animal Stak? All in all, you can think of the longjack extract complex as the doorway that helps support free testosterone to flow through your blood. In addition, the Pro Testosterone Complex is rounded out by fenugreek seed, stinging nettle root and maca extract. Fenugreek contains high amounts of furostanolic saponins, which are natural plant chemicals that can boost testosterone levels. Finally, this complex contains an exotic herb that is native to Peru, maca extract. Maca contains specialized plant sterols. Researchers that worked with maca speculated that it naturally supports free testosterone levels. * Working synergistically with these other pro-free test substrates, that speculation rang loud enough to make the cut in the reloaded Stak. Next up in Animal Stak from Universal Nutrition is the GH Support Complex This complex consists of specialized natural growth hormone (GH) boosters and support agents. Growth hormone is a protein-based polypeptide hormone made up 191 amino acids that are synthesized and secreted by cells in the anterior pituitary called somatotropes. Protein synthesis and the transport of amino acids are crucial to muscle growth. These effects are mediated by insulin-like growth factor (IGF-1), another highly anabolic hormone produced in the liver and other tissues. Up next in the Growth Hormone Support complex are two, unique patented compounds-Immunolin® and Humanofort™. Awesome, premium ingredients that fortify an already imposing and potent micronutrient blend. Immunolin® is a purified immunoglobulin isolate that contains beneficial growth factors, immune-supporting cytokines as well as other immuno-proteins. We've also included a new Hormone Amplifying Blend that provides key patented herbs and aminos such as AgmaPure™ (agmatine sulfate), GlycoCarn® (glycine propionyl L-carnitine HCl), AstaPure® (astaxanthin) and Bioperine® with l-carnitine and quercetin mixed in. Together these herbs and aminos have been shown to help further support the natural hormone boosters in Stak by helping to create the ideal anabolic environment for them to succeed in. AgmaPure™ Agmatine Sulfate is thought to improve nutrient partitioning thus leading to more glycogen storage and increased water retention within the muscle. It also increases the level of nitric oxide (NO), which can increase the "PUMP" that athletes look for when weight training. GlycoCarn® is a powerful, research-backed, patented carnitine form that is made up of glycine propionyl L-carnitine HCl. GlycoCarn® helps increase nitric oxide (NO) synthesis which causes vasodilation and allows for greater blood flow and delivery of oxygen to working muscles. In addition, L-Carnitine has been suggested to support hormonal responses to resistance exercise and recovery and resulted in a greater number of intact receptors for hormonal interactions. AstaPure® (astaxanthin), is a natural super antioxidant carotenoid made by plants and algae. It has been suggested to help support natural testosterone production and as an antioxidant, astaxanthin benefits cardiovascular health, immune system health, eye health and even supports healthy skin, bones, and joints. Quercetin is an antioxidant flavonoid found in certain fruits and vegetable that assists in the bioavailability and absorption of the other nutrients in the complexes. This is where Animal attempts to further break away from the pack, by creating the best possible scenario for the anabolic processes intended by the Stak formulation to work their muscle building "mojo". Rounding out the new Animal Stak formula is a newly designed Restorative Support Complex. This complex is jam-packed with restorative nutrients to optimize ones internal anabolic environment. The herbs and nutrients within this complex provide important support for healthy adrenal, liver, cortisol function—all-important but often-overlooked aspects for not only promoting proper recovery and repair but also in maximizing natural hormone levels. * The Restorative Support Complex contains a blend of milk thistle, astragalus, ashwagandha extract, Na-R-Alpha Lipoic Acid (Na-R-ALA) and Coenzyme Q10. Together they help assist the body from a variety of health-supporting angles, allowing better training capacity, improving endurance, minimizing the catabolic stress response, supporting sexual health and boosting overall immune system function. * This is the ultimate purpose of Animal Stak, thus the reason we go the extra mile to make sure this new formula is complete, comprehensive and loaded to the hilt.